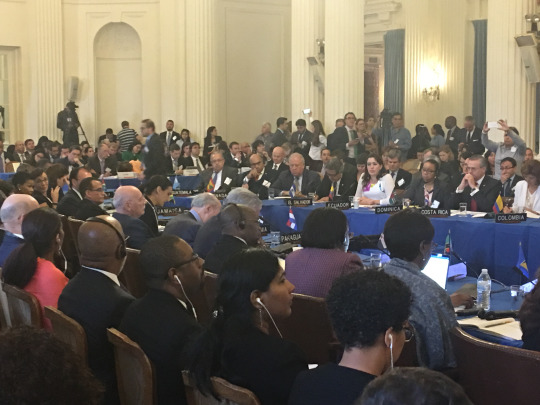 On May 31 the Organization of American States (OAS) held a meeting of Ministers of Foreign Affairs to discuss the situation in Venezuela. The meeting showcased consensus on an important point: that the solution to Venezuela’s crisis involves a process of political negotiation between the government of President Nicolas Maduro and the Venezuelan opposition. Nevertheless, important divisions remain that could fundamentally shape if and how the OAS facilitates such a process. The days leading up to the meeting saw two draft declarations surface: one circulated by Antigua and Barbuda, and the other by Peru, Canada, the United States, Mexico, and Panama. Less than 24 hours before the foreign ministers’ meeting, however, the Caribbean Community (CARICOM) circulated a consensus statement and accompanying resolution, which Antigua and Barbuda adopted, withdrawing their own initial document. The remaining two documents became the focus of debate at the foreign ministers’ meeting. The Bahamas’ representative, Foreign Minister Darren Henfield, suggested a pause to see if the differences between the documents could be resolved and a final resolution could be adopted at the meeting. Despite efforts to do so, the meeting ended with no consensus. Instead, it was agreed that the Permanent Council (made up of member states’ OAS ambassadors) would plan to meet to discuss the issue one more time before the June 19-21 OAS General Assembly in Cancún, Mexico (though no date has been announced for the Permanent Council meeting so far). At first glance, the differences between the two documents appear to be relatively small. Both call for the Venezuelan government and the opposition to engage in dialogue to resolve the current impasse, and both contain offers to create a “group or other mechanism of facilitation” to support and accompany both parties’ commitments. But the CARICOM statement does not include important points contained in the draft submitted by Peru et al. Unlike the Peru et al resolution (and Antigua and Barbuda’s since withdrawn document) the CARICOM proposal does not call on the Maduro government to halt its plans to hold a Constituent Assembly (see WOLA’s statement on the Constituent Assembly here). The CARICOM statement also refrains from calling on the Venezuelan government to meet three conditions included in the Peru et al resolution: to free political prisoners, respect the separation of powers, and establish a clear timeline for free and fair elections with international observers. The Peru et al resolution further describes these as part of the “commitments undertaken by the parties, made by the Working Group during the previous process of national dialogue,” referring to Vatican-mediated talks in October and November 2016. The first omission is highly significant, because the Maduro government is clearly attempting to use the Constituent Assembly to avoid going to elections it knows it will lose. What is more, the electoral bases forwarded by President Maduro stack the deck in favor of Chavismo and would likely lead to a Constitution that leads to a “communal state” or something other than a democracy based on direct and universal elections. However, it is also worth noting that the Peru et al statement is making a stretch in referring to these three conditions (freeing political prisoners, an electoral calendar, and respect for the separation of constitutional powers) as “commitments undertaken by the parties.” As David Smilde noted at the time, a November 2016 agreement did include a commitment to end the Supreme Court’s holding the National Assembly in contempt, but it made no mention of elections, nor did it include language regarding political prisoners. What the resolution may be referring to is a December letter from the Vatican to both the MUD and the government, which laid out the above conditions, as well as calling for measures to address scarcity of food and medicine. To date the Venezuelan government has shown little progress on these fronts, however. Thus, despite sharing an emphasis on the necessity of a solution negotiated among Venezuelans, the competing declarations are in fact quite different. Consensus eluded the participants in the May 31 meeting, and is not at all clear that an agreement will be reached ahead of the June 19-21 General Assembly in Cancun, Mexico. Interestingly, the hemisphere’s representatives will be joined in Cancun by Venezuelan Foreign Minister Delcy Rodriguez, who has announced that she plans to attend the General Assembly despite the fact that her government has begun the process of withdrawing from the OAS.